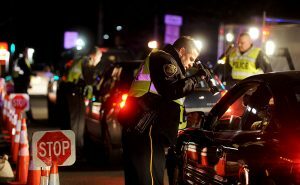 The issue in a recent case, however, centered upon whether the deviations from the written operational plan of an OUI/DUI roadblock conducted by the Massachusetts State Police rendered this particular “field sobriety checkpoint” unconstitutional. In the case of Commonwealth v. Jamie Baker, Massachusetts State Police planned to conduct a “saturation patrol” and a “sobriety checkpoint” in Abington. According to the plan devised by the state police, the roadblock was to begin at 11:30 p.m. The state trooper in charge ordered that all troopers that would be participating in the sobriety checkpoint arrive for a training and briefing session prior to the checkpoint start time. Three troopers, however, arrived after the roadblock had already began; but they were brief when they arrived. The defendant here was pulled over during the OUI field sobriety roadblock. He was allegedly observed to exhibit “signs of intoxication,” and was directed by troopers to the “pit area”. The defendant, however, refused to drive the vehicle and he was escorted to an area and asked to perform field sobriety tests. After the field sobriety tests, the defendant was placed under arrest. Following the completion of the DUI roadbock, none of the Town of the Abington Police Officers submitted their activity reports; and four of the Massachusetts State Police troopers failed to submit them as well. Another trooper neglected to sign the duty roster attesting that he had reviewed the field sobriety checkpoint plan and MA State Police General Order TRF-15 that governed sobriety checkpoints. Based on these facts, the motion judge in the trial court held that the Commonwealth failed to demonstrate that the roadblock was conducted “in strict compliance” with the plan. The motion judge found that several officers after the reporting time detailed in the plan; while the Captain was briefing the late officers, he was not performing his “supervisory duties”; one trooper (not involved with stopping the defendant’s vehicle) did not sign the duty roster affirming he had reviewed the plan; and after the roadblock was completed, several officers failed to submit a report as required by the plan. As I have indicated in previous postings, in order for an OUI/DUI sobriety checkpoint or roadblock to be constitutional, the selection of motor vehicles to be stopped must not be arbitrary, safety must be assured, motorists’ inconvenience must be minimized, and assurance must be given that the procedure is being conducted pursuant to a plan devise by law enforcement. Police officers may not have discretion to target which vehicles to stop. In reviewing whether the motion just correctly applied the legal principles in this case, the Appeals Court noted that discrepancies with the plan do not automatically make an OUI / DUI sobriety checkpoint illegal. As it applied in this particular case, the Appeals Court noted that the deficiencies that occurred here did not directly affect or relate to the stop of the defendant. Specifically, the officers who had arrived late did not interact with the defendant. Although one of the troopers that interacted with the defendant failed to sign the duty roster, there was no indication that he had not been briefed appropriately or that he was unaware of his responsibilities under the plan. Additional, the Town of Abington police officers’ failure to complete reports following the roadblock did not introduce any use of “discretion” during the actual roadblock process and in the selection of vehicles. The Appeals Court concluded that none of the deviations at issue here introduced any opportunity for discretionary departure by law enforcement int he field from the dictates of the plan.” They further noted that none of the discrepancies had any effect on the defendant and did not violate any of his personal rights. Accordingly, the Appeals Court reversed the lower court’s order suppressing the stop and holding that the sobriety checkpoint was unconstitutional. What this ruling essentially says is that, although sobriety checkpoints must be performed according to a plan, as long as any deviations from the plan are minor and do not affect the rights of the person pulled over, the court is going to uphold the stop/checkpoint. What then will be considered minor “discrepancies” or “deviations” that are considered OK? Well, that will depend on a case-by-case basis. In future challenges to DUI roadblocks, trial attorneys should highlight any deviations from “the plan” and, if possible, focus on how such discrepancies deviate from the plan and affect that defendant’s rights.